Amanda Jackson Band: Amanda Jackson Band & Friends ft. Ross Neilsen! Amanda Jackson Band & Friends ft. Ross Neilsen! 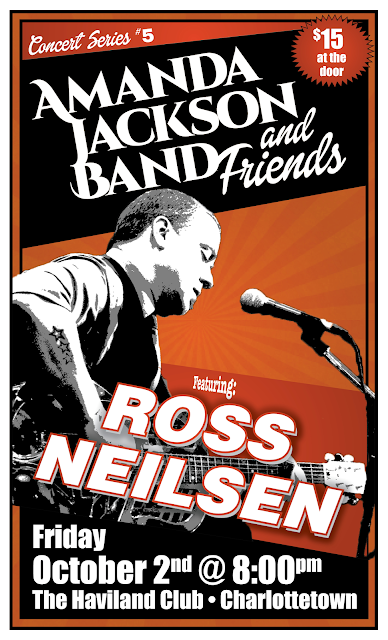 This Friday night we are so happy to welcome the always awesome Ross Neilsen to the fifth installment of the Amanda Jackson Band and Friends Concert Series! Canada’s hardest working blues rock musician, Ross Neilsen, does it right. He’s taking strong, timeless material to the place that matters: The People. Seven Years, over 1200 shows and more than half a million kilometers traveled. In a time of corporate cookie-cutter music, this is the return to real. Proving hard work pays off Neilsen has been honoured with a nomination for Best New Artist at The Maple Blues Awards in 2010, two Rising Star nominations from CBC, back to back Blues Album of the Year nominations from the East Coast Music Association, a win for Best Blues Recording for Redemption at the 2010 MusicNB awards, a semi finalist in the solo/duo category at the International Blues Challenge in Memphis, TN in 2012 and most recently Five nominations from Music New Brunswick including Album of the year, best group and best rock recording for RESURRECTION as well as Best male solo Recording for THE SHACK UP SESSIONS and a win for best blues recording for THE SHACK UP SESSIONS. He is a real, old-school kind of artist. Write. Tour. Record. Tour. Repeat.